Can I just tell you how appalled I was when I saw this image in a recent article featured on Yahoo Sports? The image featured in the article depicts a photoshopped Tim Tebow in place of the Messiah in a well known Mormon image "The Second Coming" by Harry Anderson. 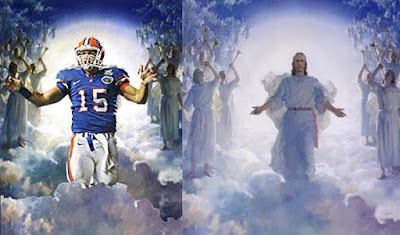 Whether this is intended as a fan image or a jest, the fact that either side would replace the Savior with Tim Tebow is offensive and unsettling. I know Tebow would be disgusted to see this as well. I just have to say it is a shame that our media mocks someone for being religious by also mocking the Savior. Sure, go ahead and make fun of Tebow for being overrated, cocky, and a bit self-righteous. But don't mock Christ and deface this beautiful piece of artwork that members of the church cherish. It is a shame that being Christ-like or religious makes you an easy target of these kinds of blasphemous jokes. I would expect something like this from some dense fan or critic, but not from Yahoo! Sports.